Gift Chansa grew up in the Chibolya compound, a notorious crime spot in Zambia. 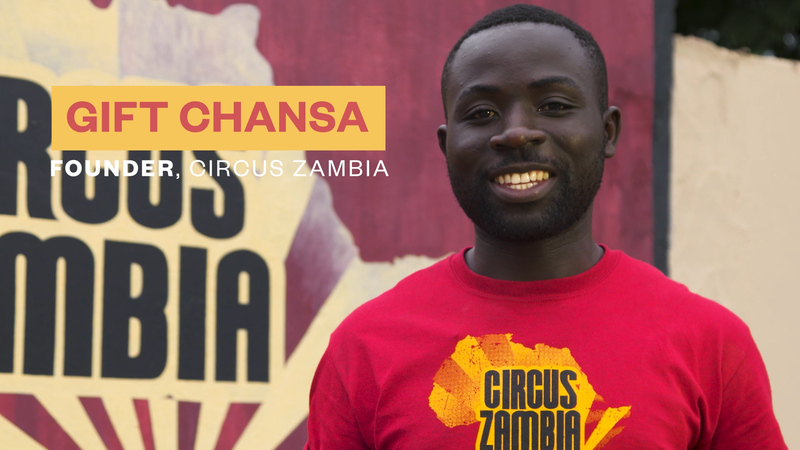 He is the co-founder and artistic director of Circus Zambia, a non-governmental organisation that equips young people with not only circus training, but also with life and social skills and educational support. We spoke to Gift about his motivations for starting the organisation and about the importance of engaging young people. Why did you want to set Circus Zambia up? The reason why I wanted to set up Circus Zambia, not just alone but with my colleagues, was because we wanted to start saying to the public that Chibolya is not a bad place and that young people like us want to do something positive and you should give us a platform. We wanted it to be that when people speak to someone from Chioblya they don’t think of them as a thief. What does Circus Zambia do to help young people living in your community? There are three areas of Circus Zambia – body, mind and soul. In body it’s the beginning, it’s how we started – young people getting involved and wanting to join what we do through circus. We go into the community, we do backflips, we mobilise young people, we write the names up and they start coming to the circus. That’s the body. Then we’ve got the soul. When we bring them to the circus, we don’t just want to do circus, we want to talk about issues that affect young people in the community and how they can be supported. Then we’ve got the mind. The mind is where we offer school support. I feel like its old-fashioned to teach people the way the school does. We need to do something innovative and creative and engage people in a fun way. Having fun but also getting info. Why is it important to give kids from all backgrounds a fair chance at gaining a skill? If you bring young people together they get inspired by watching what other friends are doing. They learn from each other by knowing we all face challenges and this is what we should do to improve ourselves. It’s a skill to communicate with someone but if young people don’t know how to use this skill then it is difficult for them to conquer the world. First of all, you create an ensemble. So you bring different young people from different backgrounds and they start working together. In circus, you learn principles of picking up things, when you drop things you pick them up and start again. It’s easy to apply those principles in life as you go on. Sometimes we do exchange with people around the world. They come to Circus Zambia and, for our kids, it’s important to meet someone else doing circus. It is not just me that is doing it, it is also other people and it dares them to dream. Some of them they fail circus and say I can’t juggle, so you ask them ‘what can you do?’. And they say football and you say well that’s your talent. Let me take you where you can play football. So it helps them to discover things they can do. I have so much hope for Zambia, so much potential, so much can be done. For us and for me I can see the potential that’s there. When you travel abroad you can see how much you can do and how much potential is there. The future is bright for Zambia cos young people are now active and engaged in activities in private sector and government and all different parts of Lusaka, Zambia.